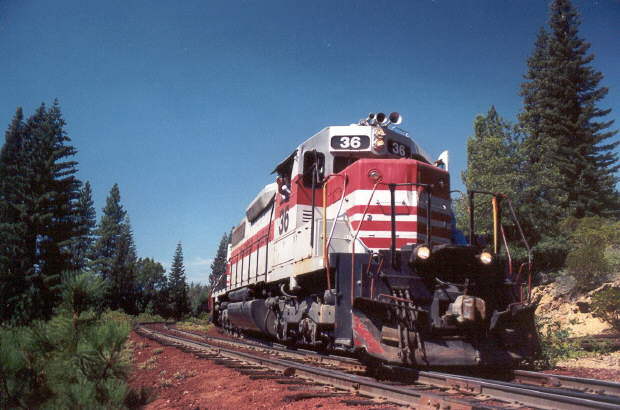 This picture shows Malen on the #38 in 1989 at Lookout Junction. Photo is by and courtesy of Greg Brown. 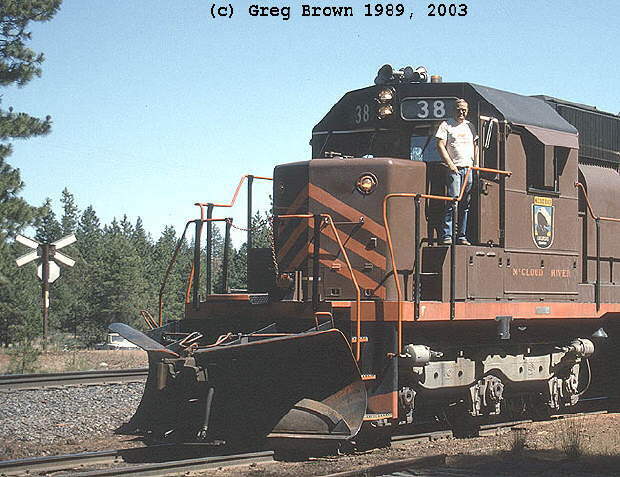 responsible for track maintenance in the Burney area. 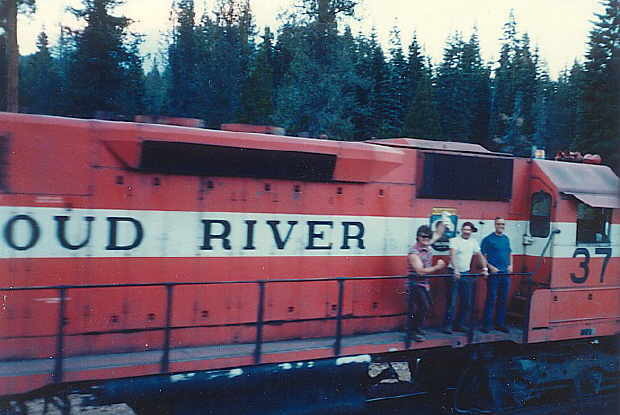 He moved into train service by the 1960's, and promoted to engineer in the spring of 1969. Malen became the senior engineer on the road in the late 1970's, and in the dark days of the early 1980's he was often the only engineer working on the road. Malen's last run arrives at Signal Butte on the return trip back to McCloud. Photo courtesy of Larry Tuttle. 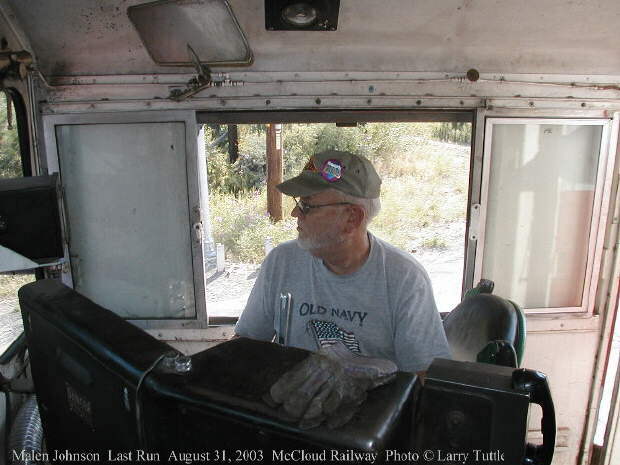 Malen's last run occurred on Sunday 31 August 2003, when he ran a Yard & Hill job to deliver loads brought from Burney the day before to the Union Pacific interchange in Mt. Shasta City. 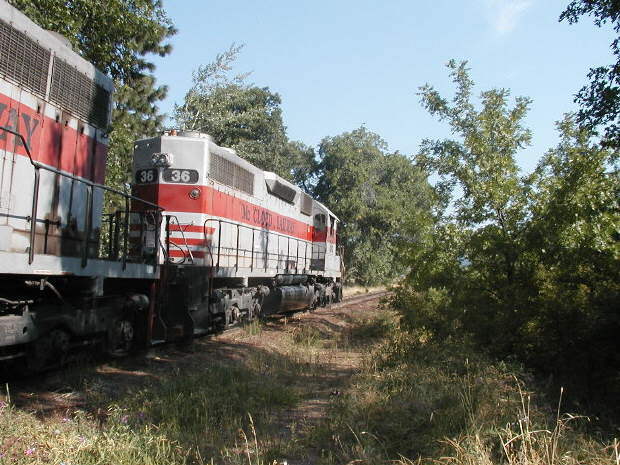 Weekend freight movements on this railroad are rare, but almost record-setting shipments out of the Sierra Pacific sawmill in Burney forced the railroad into weekend operations to keep up with the traffic it was producing. Malen at the throttle of the #36 on his last run. 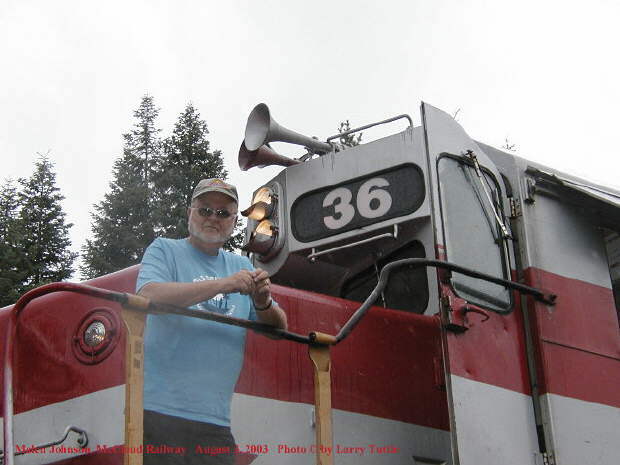 Photo courtesy of Larry Tuttle Malen will continue to hold his engineers certification, and he will continue to work part time as an engineer for the Shasta Sunset Dinner Train and will most likely come out of retirement to run the steam engine for some time to come. This photo is by and courtesy of George Landrock...it shows a younger Malen (on the right along with brakemen Ralph and Milton) while working on a Yard & Hill job.